"Vertoz’s strategic vision is, to discover and employ tools, technologies and data points through programmatic advertising strategies." Ashish Shah, Founder and CEO, Vertoz is responsible for the leadership and direction of the company. 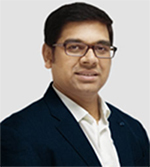 He looks after the day-to-day operations, as well as leading the company’s product development and technology strategy.Ashish spearheads the company’s strategic vision and growth in providing state-of-the-art services. He is working towards keeping the company steady and setting it on its current path to profitability and success. Vertoz is a leading programmatic company that offers engaging and innovative advertising and monetizing solutions. The company’s ingenious plex, proprietary technology and advanced capabilities empower a global roster of top advertisers and publishers all under one roof.It monetizes traffic from all verticals and geographies to earn the best ROI for our customers. The company’s high flying traits include premium traffic quality, precise targeting, real-time tracking and detailed analytics. Vertoz’s experienced Account Specialists and AdOps team outstandingly execute and implement advanced monetizing solutions tailored for each client. Replying to Yash Ved of IIFL, Ashish Shah says "Vertoz’s strategic vision is, to discover and employ tools, technologies and data points through programmatic advertising strategies." What demand do you see for the digital advertising? Digital advertising is a vast space with number of publishers and advertisers out there looking to advertise and monetize. The demand has always been high from both the demand side and supply side. As a demand side platform (DSP), we have a large pool of direct advertisers and we see a lot of demand coming in from many advertisers to publish their advertisements on various websites. Vertoz has been receiving a lot of requests from the supply side(publishers), for monetization. We have a large pool of direct publishers and the number has been increasing. For the current publishers, we are working on more DSP integrations to help increase revenue and fill. Vertoz is ramping up the buy side to get more advertisers on board and integrating multiple SSPs to help get traffic to advertising campaigns. We are also working on making the advertisements more innovative and will soon start with native ads. We are already partnered and trusted by many brands across the world and we plan to build many such strong partnerships in the coming years. We are a profitable bootstrapped startup and have been doing good so far without any funds. The company has grown a lot since 2012 and has been performing well in the online advertising ecosystem. However, when it comes to fund raising plan, we are looking for strategic partners with better connections in the industry and not just the money. What is the company’s strategic vision? Vertoz’s strategic vision is, to discover and employ tools, technologies and data points through programmatic advertising strategies. Thus helping us to automate the buying and selling of digital media and providing solutions to both the advertisers and publishers. What growth do you expect for the current year? The growth that we expect for the current year is not just financial but also technological. We want to upgrade our technology to make it more user friendly for our customers and build strong partnerships with huge brands in the industry. With the current 50% YoY growth, Vertoz is evolving at an extensive rate. Yet, we wish to surpass it and reach a 100% growth. Being a SaaS (Software as a service) company, we work on a revshare model. We charge percentage fee on both the advertiser side budgets and publisher side earnings.